This spacious 3 bed homes is great for those looking to take the next step on the property ladder. Downstairs you have a comfortable living room benefiting from a large storage cupboard. To the rear of the home is a spacious kitchen/dining/family room leading to the back garden. Upstairs there are 3 double bedrooms with the master bedroom benefiting from an en suite.RoomsGKitchen / Family / Dining (5752mm x 3073mm (18'10' x 10'0')Lounge (3615mm x 3973mm (11'10' x 13'0')Wc (1910mm x 1170mm (6'3' x 3'10')1Bedroom 1 (Double) (3465mm x 3923mm (11'4' x 12'10')Ensuite 1 (1427mm x 2280mm (4'8' x 7'5')Bedroom 2 (Double) (3465mm x 4340mm (11'4' x 14'2')Bedroom 3 (Double) (2482mm x 3079mm (8'1' x 10'1')Bathroom (2182mm x 1873mm (7'1' x 6'1')About Chapelton RiseSIGN UP FOR REGULAR UPDATES. 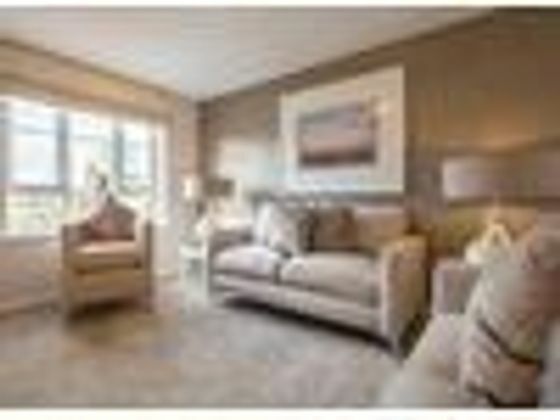 Chapelton Rise is a development of 3 and 4 bed homes in the Auchenkilns area of Cumbernauld. We're close to the M80, M73 and M74 allowing an easy commute to both Glasgow and Stirling. This is a fantastic development for first time buyers and those looking to take the next step. Find your new home in 2019.LeisureLeisure facilities are plentiful in Cumbernauld, with a great choice of options, including a theatre at the New Town and a museum with a library. Nature lovers will enjoy a day at the Cumbernauld House Park which is bordered by the Ravenswood Local Nature Reserve and is ideal for dog walkers. The Westerwood Hooffers food, accommodation and golf facilities.EducationPlease speak to North Lanarkshire Council for confirmation of catchment area.ShoppingWith Antonine Shopping Centre close-by, you're spoiled for choice with everything from River Island, TK Maxx and JD Sports. There's also Tesco Extra, Asda Superstore, Farmfoods and Iceland for your food shopping. Local banks include Clydesdale Bank, Royal Bank of Scotland, Santander and Lloyds TSB among others.TransportCumbernauld is one of the best connected towns in the central belt. With the M80, M73 & M74 nearby for an easy commute to both Glasgow and Stirling. The nearby Greenfaulds train station also runs train services that arrive into Glasgow Queen Street and Falkirk.HealthThe nearest health centre to Chapelton Rise is the Condorrat Health Centre located on Airdrie Road, Cumbernauld. The closest hospital is the NHS Lanarkshire Central Health Centre, North Cumbria Road, Cumbernauld. A collection of further health centres can also be found within Cumbernauld.Opening HoursThurs - Sunday 10am - 5.30pm, Mon 12.30pm - 5.30pmDirectionsSat Nav: G67 4HADisclaimerPlease note that all images (where used) are for illustrative purposes only. Property advert Ref 4277989 - Is a property advert for marketing purposes only, the information has been supplied by the owner, estate agent or property portal and The House Shop makes no warranty as to the accuracy or completeness of the information. Furthermore we have no control over the adverts content. This property advertisement does not constitute property particulars. Please contact the advertiser to obtain any information regarding The Energy Performance Certificate regarding homes in England and Wales or Home Report for residential property in Scotland.